Sometimes you just want cookies, and since starting the Orange Rhino Challenge, that time has come more often than usual. 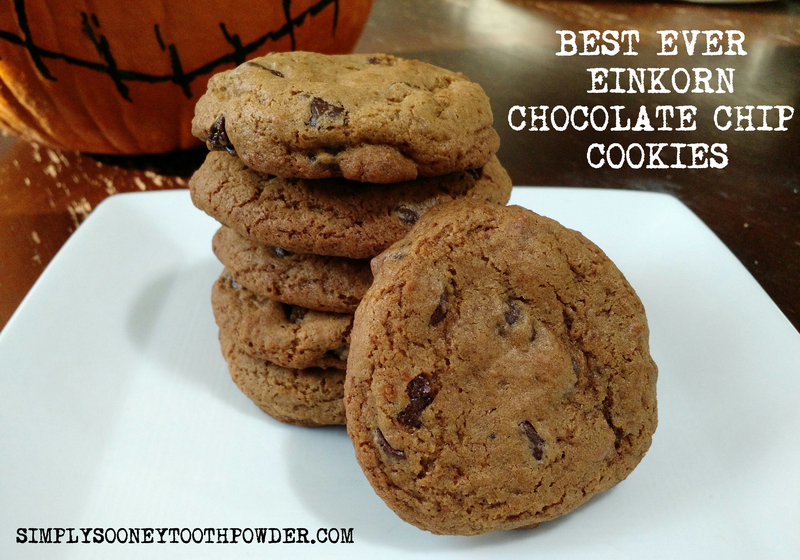 I recently began using Einkorn flour because we were gluten free for a long time. My husband has Hashimoto’s and cannot tolerate traditional gluten containing goodies (or baddies I should say).My husband is much better able to digest this ancient grain and we are loving having it as an option. I hope you will enjoy them also! In a separate bowl whisk together einkorn flour, baking powder, baking soda, and salt. Slowly mix the dry ingredients in with the wet. Blend until you do see any clumps of flour. In a preheated oven 375 degrees, cover a flat baking sheet with parchment paper. Using a cookie scoop or a tablespoon, drop cookies onto pan. Bake in the over for 11-14 minutes. Cookies will look like they aren’t completely done in the middle. Allow to cool for 5-10 minutes (if you can wait that long) the centers will lower a bit leaving you with perfect beautiful cookies!